In this paper we give an overview of Samsung‟s Logistics Integration over the last five years. 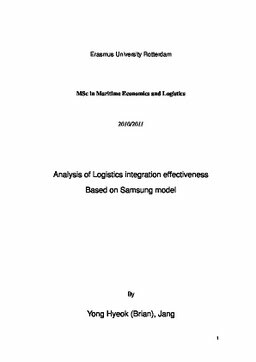 Furthermore this paper shows on what grounds the Samsung‟s logistics operation integrated and what this means for the logistics flows of Samsung Electronics and how it can be explained and analyzed based on academic researches and literatures. Even though Samsung‟s logistics integration mostly has shown very positive results, there is still some room to improve more and the Performance Index comparison between before and after the logistics integration will guide us what has been improved by using statistical methods. Finally this paper will give you an idea with a detail examples actually adjusted in Samsung‟s daily logistics operation which lead to a successful logistics integration Furthermore it would be also applicable as a possible solution which may improve alike Performance Index in other logistics companies so that their logistics integration effectiveness can be maximized and optimized while it keep their current advantages of logistics integration.